The first service pilot for sustainable intensification of agricultural management is split in two parts: It provides a smart farming service for the nitrogen fertilisation of rapeseed in Germany for the champion user BayWa and a monitoring service for potatoes in Belgium for the champion user BelgaPom. The service for rapeseed is based on Vista’s TalkingFields smart farming service in Europe. For Pilot 1 this service is transferred to the Food Security TEP, allowing the processing chain of the satellite imagery to be calculated completely on the Food Security TEP to derive meaningful crop parameters that can be used as input for smart farming measures. The European farms for which this service is provided in the service pilot are characterised by a high degree of mechanization as well as up-to-date technical equipment (e.g. GNSS guided tractors, dedicated Farm Management Information System software). Data driven information services support sustainable and cost-effective agriculture by combining Earth Observation and navigation satellites' input with information from ground sensors to help farmers decide how, when and where to allocate resources for the best economic and ecological results. The input for such smart farming applications, e.g. fertilization or plant protection measures, are site-specific information on specific plant parameters. The vegetation products produced by Vista for pilot 1 are Leaf-Area-Index and Chlorophyll A and B content). These plant parameters as well as the atmospherically corrected data are calculated on the Food Security TEP and used as input for the customized service. The calculation of nitrogen uptake (N-uptake) for winter rapeseed is then done using the LAI development of the previous winter months as input. In addition to the European service, the Leaf Area and Chlorophyll Content are also provided for parts of Zambia for monitoring of biomass growth and to support agricultural management at a large demo farm there. The second part of the service pilot, is based on VITO’s Watch iT Grow service a geo-information platform developed for the Belgian potato sector with the purpose to better follow, estimate and increase the potato yield in a sustainable way. With the tool the Belgian potato growers, traders and processors can quickly and in a user friendly way access data and information on the growth of different potato varieties throughout the growing season. WatchITgrow provides information on crop growth and development as observed from satellite images. 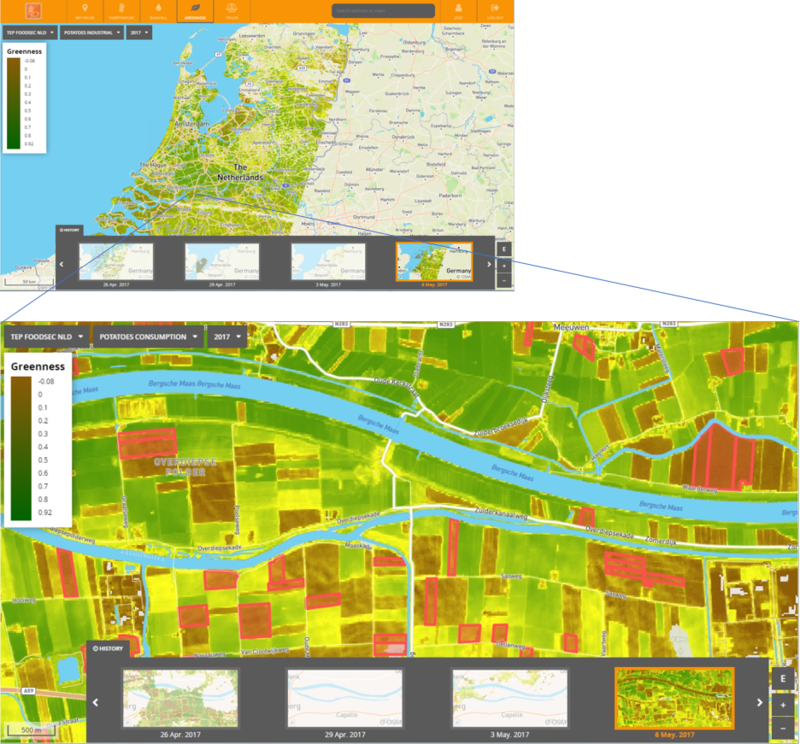 From the greenness maps you can easily detect variability within your field and compare crops growing on different fields. By monitoring the weather data (temperature and rainfall) you can better assess the risk for production or quality losses at your fields. Within this FS-TEP pilot, the backbone of the service, i.e. the calculation of the greenness maps, the combination and the comparison of the temperature and rainfall data was moved to the FS-TEP environment, demonstration the scalability and transferability of the service to other regions in Europe and the world. Providing information to the farmers and the industry on which actions to take on which fields to increase potato yields in a sustainable manner.